Day two of the NSDA Winter Nationals in Yuma, AZ was another record setting day in the sport of sand drag racing. Geoff Gill, driving the Gill Bettencourt Motorsports dragster, broke the TF World Record with a 2.284 backed up by a 2.316. Gary Mink held on to the top qualifying spot in Top Alcohol while Leon Januik ran a perfect 2.950 for the pole in Top Eliminator. The day’s other winners were Steve Anthony (Sportsman 1), Jim Clark (Sportsman 2), Ryan Winkle (Motorcycle Sportsman 1), and Brad Deforest (Motorcycle Sportsman 2). - Geoff Gill set the new TF record with a 2.284 in Q3 backed up by a 2.316 in Q4. - Scott Whipple ran a solid 2.340 in Q3, then had an uncharacteristic 2.881 in the final session. - Dennis Rieck had a big explosion in the final qualifying session that will put him out for the weekend. - Gary Mink ran Low ET of qualifying session three with a 2.407/142.68 pass. - Nick Januik ran Low ET of a troubled final qualifying session for the TA class with a 2.584/132.68 run. - Dan Allen ran a nice 2.471 in Q3 to put himself solidly into the show. A great first day of racing is complete at the NSDA Winter Nationals in Yuma, AZ. The first day was a record setting one as Gary Mink drove his “Bad To The Bone” Top Alcohol Dragster to a new world record in the TA class with a 2.404. Needless to say, Gary is the low qualifier in that class after day one. Scott Whipple (Top Fuel) and Lori Ketron (Top Eliminator) were the other low qualifiers in the heads-up classes after early round qualifying. Charlie Johnson (Pro Bonus) and Phil Soper (Sport Bonus) were the bracket class winners on the day. - Scott Whipple makes a solid 2.338 pass in his new dragster. - Geoff Gill made a smooth 2.369 run to end up #2 for the day. - Shane Switzer had a huge top end charge on a great looking 2.386 run. - Jeff Janoe made nice, clean run with the front end hiked up through the lights, tripping the finish line on the back tires. - Rick Stewart had a wild, wheels up run, also tripping the finish line on the rear tires to a 2.698. - Dennis Rieck did not attempt a pass in the second session. - Gary Mink set a new TA World Record with a 2.404 pass that was backed up by his 2.428 in the first session. Not bad for Gary’s first race with a new Hemi combination between the frame rails. - Jim Hammond laid down a clean 2.604 for his best pass with the new April’s Dream car. - Scott Carroll tripped the finish line beams with the back tires, carrying a big wheel stand past the finish line. - Dan Allen could not get his car started in time for his qualifying pass, but when he was able to get the car fired up ran a great 2.424. - Scott Whipple debuts a new car to him, an ex-Yankees sponsored NHRA TF dragster driven by Mike Dunn, and runs a solid 2.417 shutting off slightly early. - Dennis Rieck had some cylinders out on a troubled 2.76 pass. - Geoff Gill had problems at the hit on his attempt in the first session. - Nick Januik and Gary Mink both ran their best ever ET’s with flawless 2.42 passes in the session. - Mike DeNunzio made it to about half track on his first pass in the ex-Scott Whipple Top Fuel chassis. The same drivetrain that took Mike to the 2008 NSDA TA Championship was transplanted into the Top Fuel ET record holding chassis. - Jim Hammond had problems at the hit on his run. 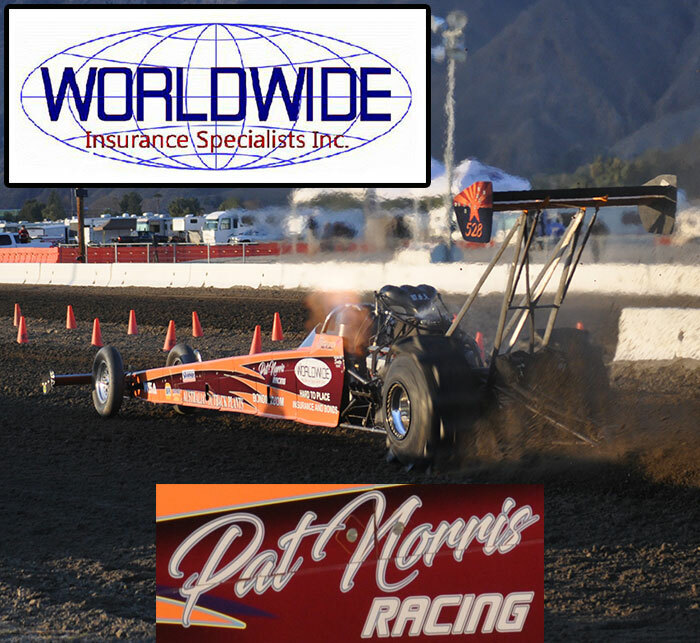 The National Sand Drag Association (NSDA) kicks off its third full season of racing in Yuma, AZ February 13-15. NSDN will be on-site with all of the latest news and results from this season opening event. NSDN’s Daily Race Coverage of the NSDA Season Opener is brought to you by the National Sand Drag Association and Heavy Metal/2 Dolla’ Bill Racing and Chittenden Motorsports. The weekend kicks off on Friday February 13 with opening round qualifying in the heads-up categories and Bonus race action for the bracket racers. Check back throughout the weekend for all the latest from this event.